Kasu. Sake kasu. Sake Lees. Dregs. Tapping into waste streams and re-purposing for deliciousness. After a tank of sake has run the course of its fermentation—anywhere from 18 to 32 days—what remains is a white mixture of sake, rice solids, and yeast. This mixture, known as the moromi, is pressed to separate the sake from the suspended solids. There are several methods of pressing the sake out, leaving compressed rice solids, or lees, behind. This is Kasu. Larger sake producers extract the sake from the lees by machine and the kasu comes out in thin dry sheets called itakasu. Smaller producers may press their sake by hand using a wooden box called a fune, which has a lid that gets cranked down on the sake mash, or moromi, which has been placed in small canvas bags. This method will yield a kasu that is moist and chunky called teshibon or namakasu. Kasuzuke or vegetables pickled in kasu, are said to have originated in the Kansai region of Japan as early as twelve hundred years ago. The first vegetables known to be fermented in kasu were white melon and were named shiru-kasu-zuke or Nara-zuke. Later, the technique would used with cucumbers, eggplants, and uri or bitter melon. It was produced primarily by Buddhist monks and used by Samurai for sustenance in wartime and winter. During the Edo period of the 17th century, sake producers promoted the use of kasu widely. Not long after, kasuzuke would become a mainstay in the ever expanding repertoire of Japanese tsukemono. We are fortunate to be located just blocks from Takara Sake one of the largest producers of sake in the United States. We have a long standing relationship with Takara, and after each pressing of their Certified Organic Ginjo Grade Junmai Nama Sake, they put aside about 150 lbs of kasu for us. The kasu has been pressed mostly dry at the factory and has a slightly sticky putty-like texture. Kasu is stored in the refrigerator and the cold makes it stiff and a little unyielding. We allow it warm in a bowl on the counter for the day and as it warms it becomes much more pliable and easy to work with. We knead salt and sugar into it until the dry sheets form a thick sticky paste. We then bury vegetables that have been salt pressed for two days into the paste . The vegetables ferment from three months up to a year or more. The result is a delightful and unique pickle with a distinct sake taste, quite unlike anything found in Western pickling traditions. Typically we intend to ferment our kasuzuke for 12 months. With this in mind we have found that a ratio of 10:3:1 kasu:sugar:salt, works well for us. Those ratios will be adjusted down for shorter term ferments of vegetables that are more tender. One of our favorite kasu pickles is burdock. Burdock. Arctium lappa. Gobo in Japan. It is the long tap root of a thistle. Dark and woody, it is deep in earthy overtones and slightly sweet. 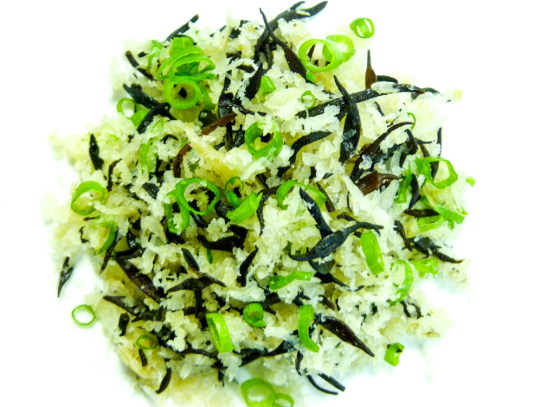 We wash the burdock well and press it at 6% salt for two days. 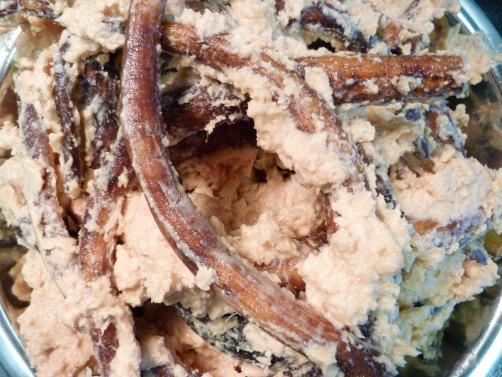 The burdock is spiraled into a vessel and layered between the kasu-sugar-salt mixture. In the initial weeks of fermentation there will be a fair amount of carbon dioxide released and pockets will appear. To combat this, and insure optimal kasu to burdock contact, we weigh the ferment down. Our burdock ferments for 12-18 months. One of our longer ferments, it needs that duration for the dense, sturdy root to ferment clean through. It is a testament to the hardy strength of burdock that after a full fermentation it retains most of its flavor and texture. Though the sake and koji permeate, it is still astonishingly earthy and woody. For years we enjoyed this pickle sliced thinly on a bias. Wood chips, I called them. Wonderful, flavorful wood chips. Then I introduced it to the microplane. Burdock kasuzuke loves the microplane. A melt on your tongue snow of sweet earth.